For the past 17 years, Slone Partners has excelled in a very specialized search practice; placing executive management and leadership both in North America’s most promising startups and historically successful life sciences, precision medicine and diagnostics companies. We do so exclusively on a retained basis, a business model we deeply believe is particularly advantageous for our clients, with results that bolster our mutual belief. But what are the main differences between contingency placement firms and retained firms like ours? Slone Partners CEO Leslie Loveless sheds light. 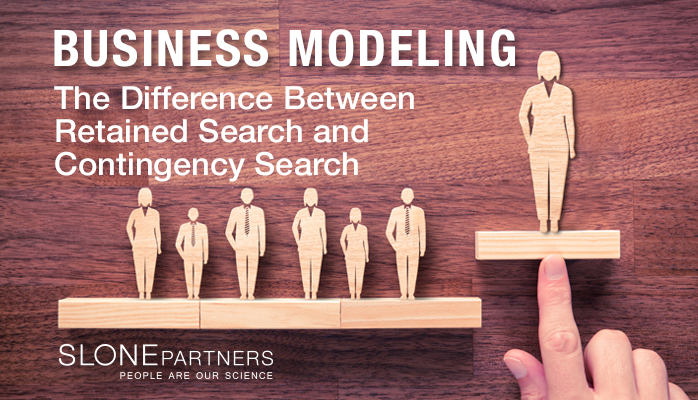 What are the main differences between the retained model and the contingency search model? In the retained search model, a client chooses one firm to represent their external search interests while searching for an ideal candidate. A fee is paid up front. The retained firm then works very closely with the human resources department, executive management or even board, to really define the profile, experience and characteristics of the person they’d like to hire. It’s a very personalized service, that is quality-oriented, focused and intimate. Then only the most supremely-qualified people sourced from across all networks – candidates who aren’t just incredibly talented, but who are the right fit culturally – are presented until the right person is hired. As opposed to the contingency model, the retained model has a guaranteed placement result. In the contingency search model, one or many firms may be simultaneously engaged without clients paying upfront fees and without the guarantee of placement. The contingency firm typically has a less intimate relationship with the client, and has fewer resources invested because no upfront fees are paid. What makes the retained client relationship different from a contingency relationship? Retained executive search relationships are typically more shoulder-to-shoulder advisory work, where time and resources are invested to deeply understand a client’s business. Also discussed are the inner workings of companies, what their strategic objectives are, the thought processes of upper management, how the companies are structured, where the person or people will fit inside the organization, and what the prevailing culture is. Because of this more rigorous work, retained firms generally temper the number of clients they can correctly service at any given time. Whereas retained relationships tend to evolve into long-term partnerships, contingency client relationships tend to be shorter-term and task-focused. What does the retained search process look like? When retained, a team of executive consultants and search professionals are mobilized, then are quickly engaged. Startup companies often get funded quickly and need to ramp up their ranks quickly. More established companies often launch new, innovative products or programs that require serious new expertise for global growth. When searches begin, the industry – without regard to geography, even globally – is scoured to find the best people, even if they’re not considering leaving their current job. Candidates are informed about new, and sometimes amazing, opportunities they didn’t know exist because these are often not publicly-posted opportunities. The retained executive search process does not stop until the position is filled. Then after a candidate is hired, retained firms often remain involved for weeks, months or even years as the candidate grows into their important new role, and moves to the next level. It’s also a very discreet process because many companies don’t wish to be identified or utilize retained firms to be intermediaries for talent who may work for their direct competition. How do the best candidates react to the two distinct models? Contingency firms often identify candidates who are unemployed or actively looking for new jobs, whereas retained firms often identify ideal – if non-obvious – candidates who are happily building successful careers elsewhere; people who are actively tracked, who are achieving business objectives, making breakthroughs, and building respect amongst their peers. When a savvy, successful candidate is repeatedly contacted, for instance, by competing contingency firms, they often surmise it’s on a non-exclusive basis and could be in a pool of many candidates. Whereas when contacted by a retained firm, candidates often understand that the client is serious, that their time is extremely valuable, and expect that their achievements, intellect, likelihood of success in the new role, culture fit probability, values, a little bit about their personal life, and individual career goals 10 to 20 years out will be assessed. It’s a thorough exercise that most candidates enjoy because it keeps them sharper and more attuned to their greatness or challenges. What is the true value proposition of retained search as it relates to Slone Partners? Our specific focus, sophistication, and unmatched network of talent are what our clients rely upon, and that can only be truly leveraged in a retained, advisory relationship. In healthcare, things can change rapidly: scientific breakthroughs, regulatory changes, and dynamics with venture capital and private equity firms investing in their portfolio companies. Time is money to our life sciences, precision medicine and diagnostic clients, and we believe our specialization not only delivers the highest-quality candidates faster and more efficiently, but often with more intimacy and focus than generalist executive search or contingency firms. We very much focus on the quality and character of individual people we approach and also place paramount importance on culture fit. We help our clients avoid what can be costly mistakes. We have Slone Partners advisors nationwide and play heavily in the most important science markets like Boston, Research Triangle Park, Austin, San Diego, Orange County, Los Angeles and San Francisco. When Slone Partners helps bring the brightest minds to the most innovative, game-changing companies, the result is advancing healthcare to the benefit of patients. That’s something we’re proud of, and with every placement, we have the opportunity to make the world a better place. Founded in 2000, Slone Partners is a premier executive search firm that specializes in recruitment for the diagnostics, life science tools, clinical trials, contract research, healthcare information technology and laboratory testing industries with offices in Boston, Washington, D.C. and San Francisco.